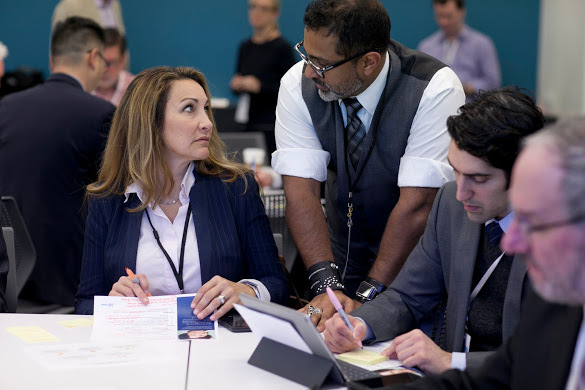 Dr. J. Andrew Chacko is a leader in Healthcare Innovation, and a highly sought after public-speaker and consultant on a broad array of topics from Design Thinking, Leadership, Healthcare, Education, Digital Health, Mental Health and Wellness. 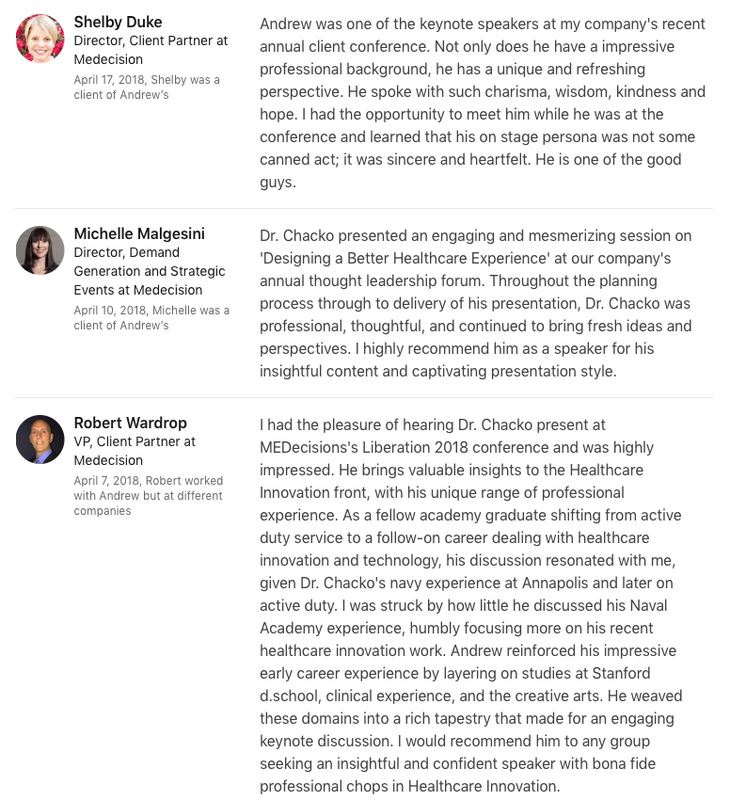 As the only practicing clinician to have graduated from the program that developed Design Thinking, he expertly synthesizes years of expertise in medicine as a Psychiatrist, work as a Designer and Innovator, and focus on Leadership and Teamwork that started with his career as a Naval Officer to help institutions and people understand and craft the future of healthcare. His unique perspective has allowed him to conceptualize the problems facing the healthcare industry. He passionately shares that ability with others through his advising and consultation work, and happily cultivates that awareness in clinicians, engineers, designers and entrepreneurs through his courses and lectures on how to implement Design Thinking and Leadership in Healthcare. 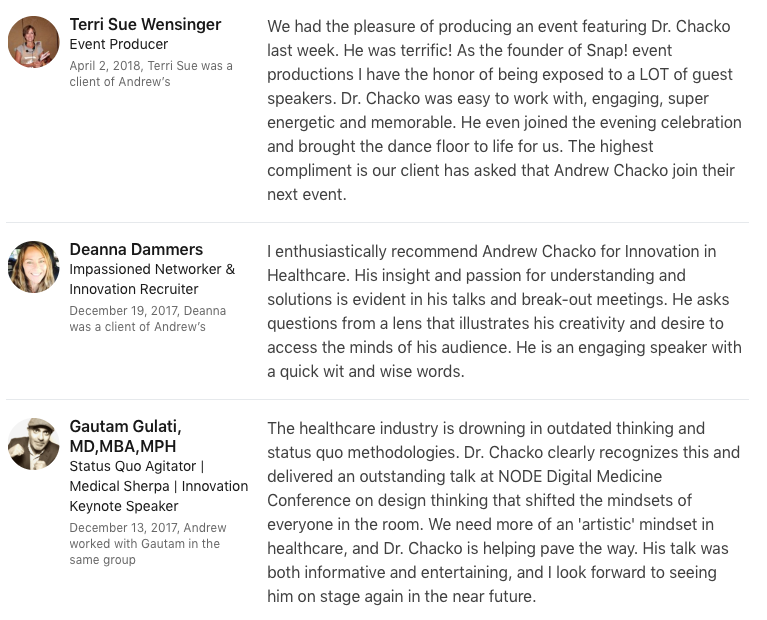 He is the founder of ChackoMD, a company he formed to drive Healthcare Innovation. As its principal, he has taught at universities and conferences and institutions around the world: such as Stanford University, UC Berkeley, Tokyo University, for the American Psychiatric Association, the American Medical Association, to pharmaceutical companies, associations of medical education professionals and Google. He has also advised design consultancies and numerous healthcare technology start-ups, and is faculty at Project Zygote, a Health 2.0 accelerator. He is a Board-Certified Psychiatrist for the VA, having worked as a Medical Director. and an attending Psychiatrist for Stanford and UCSF. He completed his training at Tripler Army Medical Center, where he was honored as the only civilian selected for a military psychiatry residency, gaining special expertise in PTSD and Traumatic Brain Injury. He earned his MD from Tufts University School of Medicine. He is a graduate of the U. S. Naval Academy, and served 12 years in the Navy, developing his leadership acumen, before completing his post-baccalaureate studies through Harvard. He earned his graduate degree at Stanford, studying both Mechanical Engineering and Art in the Joint Program in Design, taking an extra year for an in depth focus on Robotics, working as a designer independently and at IDEO.